This cozy abode in Dona Paula channels the picture perfect aesthetic of a Greek home. Haven’t you ever dreamed of going on a vacation on the whitewashed Isles of Greece? Where you wake up every morning to a view of the turquoise blue waters right from your own vacation apartment. Where your morning alarm gets replaced by the rhythmic pounding of the waves and the aroma of your breakfast is rivalled by a mixture of crisp, earthy scents. 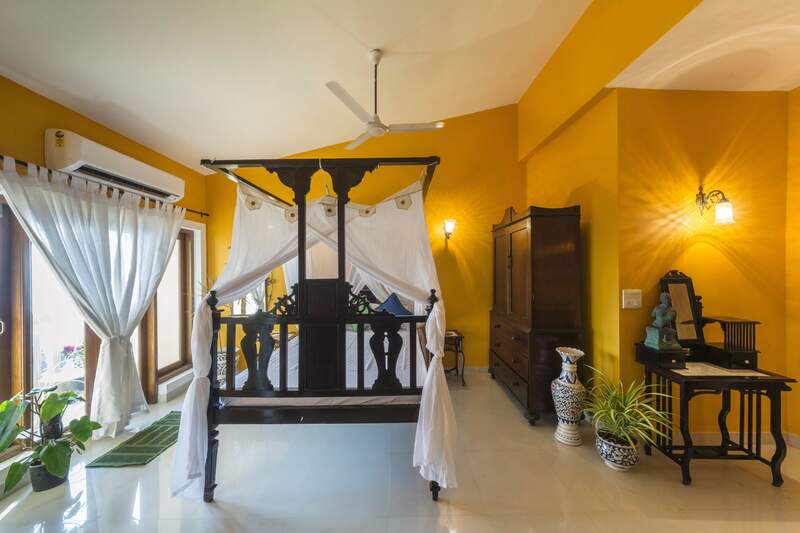 If you’re on the look-out for a beautiful, pocket-friendly and an easily accessible, Greek-holiday; SaffronStays Cabo de Goa is your answer. 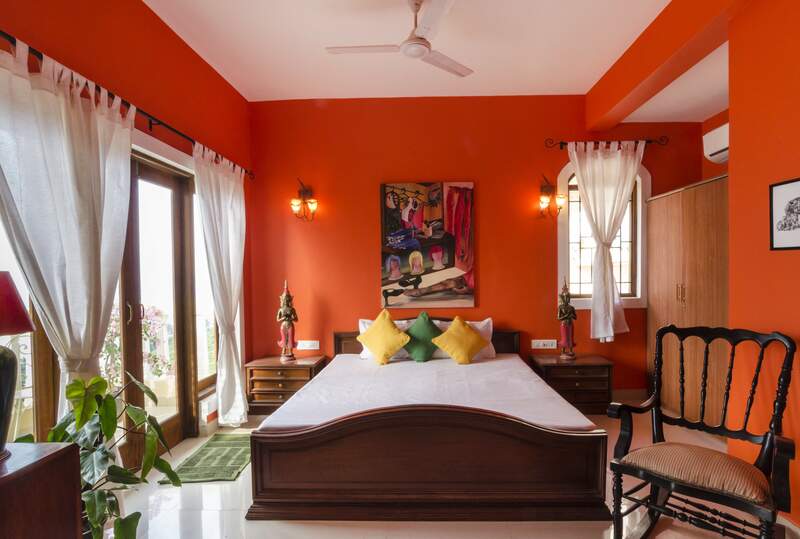 Sitting on the crest of the Dona Paula headland and offering magnificent views of the sea below, SaffronStays Cabo de Goa gives you the feeling of being among the cliff-dotted houses in Greece. This stunning 3-bedroom Mediterranean-style apartment in Goa could have been airlifted off the Aegean coast and transplanted in the waterfront corniche of Dona Paula. On entry, the floor-to-ceiling glass window teases you with a glimpse of the bright ocean beyond. As you make your way through the rest of the house, it unfolds before you, leading up to the three master bedrooms – Alveila, Cavado & Alcao – each with its own unique view of the sea. The views play perfect accomplice to the pastel-colour palette of the home. The wooden elements strewn across the space add to its cosy ambience. This is a home for all reasons and seasons, and it welcomes the outdoors in, all year round. The sun-kissed colours make the four walls and the sun appear seamless. The virescent hues of potted plants finish off the colour scheme perfectly. Gracious amounts of light streams in unfettered through the large glass doors and windows. Sit back, pour a glass of rosé and watch the gentle waves scatter the evening sun like tiny sequins. 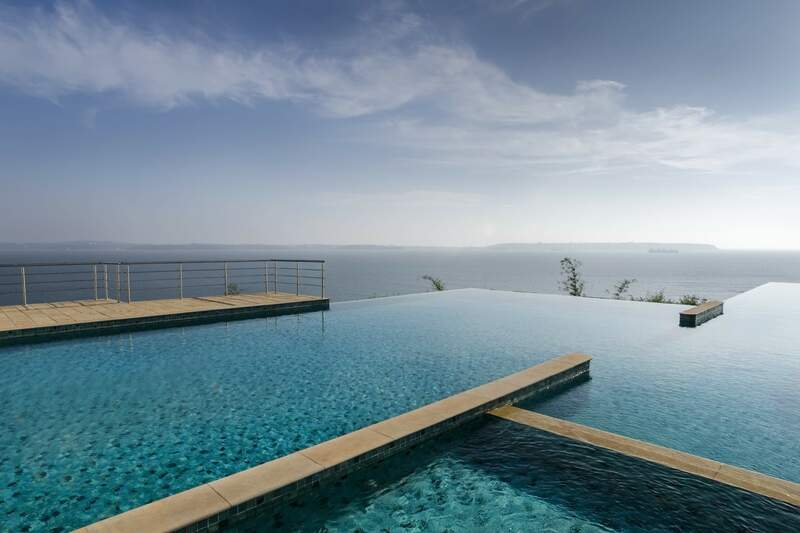 The true highlight of the place, however, remains the infinity pool, barely 150 meters from the apartment. Just make sure to bring a pair of binoculars – if you’re lucky you’ll spot dolphins riding along the waves below. Also, don’t forget to check out the Mario Miranda wall decal in the living room depicting ‘A Goan wedding banquet’. It truly reflects the identity of Goa and artistically tells the story of the land. 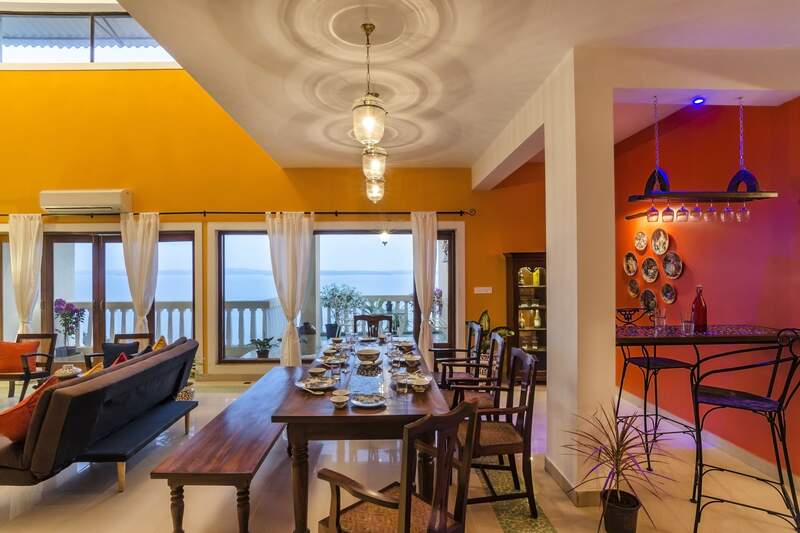 The opulent beauty of the apartment and the constant music of the waves crashing against the rocks make SaffronStays Cabo de Goa ideal for a Santorini-inspired Goan vacation.